But can we call it just wall paneling? 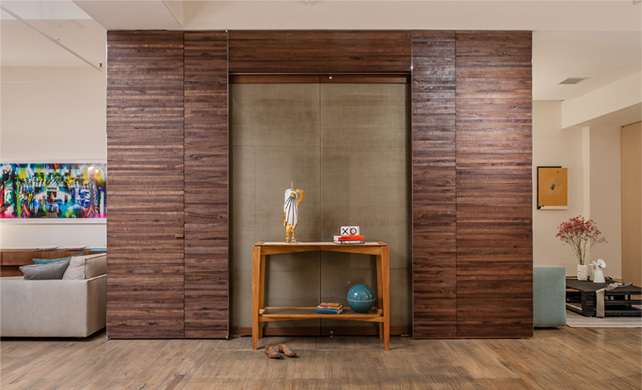 Indeed, it is a paneling because the beautiful whitened oak veneer incredibly continues for all it’s length. 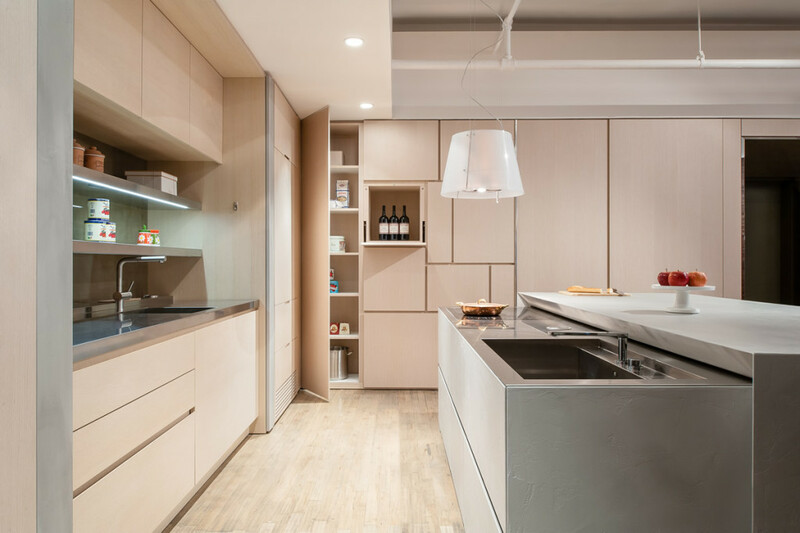 But inside you find: an entire closet, the main entrance of the loft, the emergency exit to the building’s stairs, a small laundry, some kitchen cupboards with ovens and appliances and finally a small pantry. The design of this piece it takes us more time than all the others because it depends from appliances chosen by the customer (see a beautiful sketch). The final design is not a bad compromise of those different functions: it comes from them and it is like a “Mondrian” abstract outline. The wow effect certainly comes when you open all the doors and see what is inside this huge plane wooden surface! 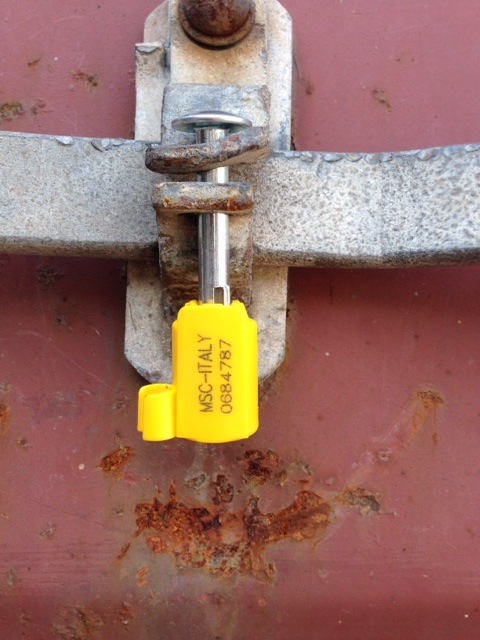 Guess how we managed it…like we do for yachts! The media cabinet is a huge piece of our production and hosts all the media devices of the loft and a hidden opening to the freight elevator( Please see our 3D drawing compared to the picture above). You can find it in front of the entrance door of the loft and it is definitely the most important piece of the loft furniture. Actually it is not a simply piece of furniture , but it is part of the loft’s interior. ( it s impossible to move it away from here!) It is designed like a portal of solid Italian walnut stripes with a big niche in the centre. The portal is aligned with the main beam of the ceiling and the AC duct is covered in the upper part behind it. 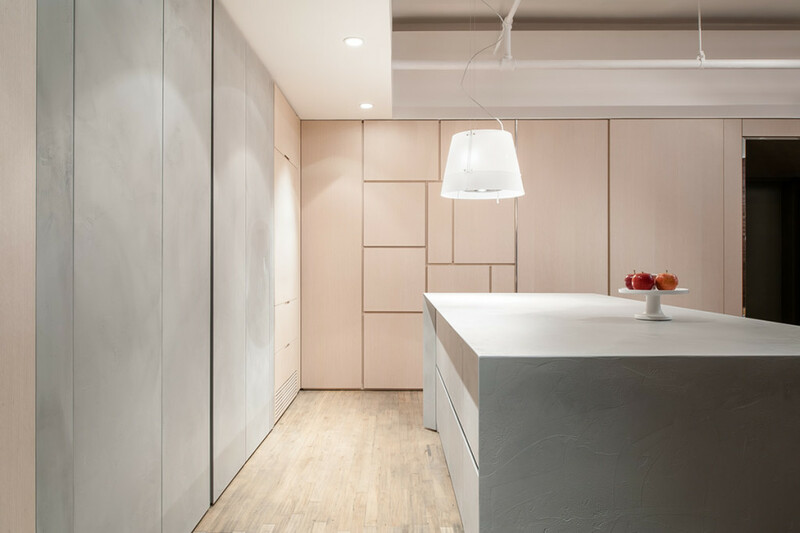 The niche has a glass backdrop divided in two ( the doors to the freight elevator): the glass sandwich panel is made of two glass layers – transparent the first, opaque the other- with a linen fabric inside. 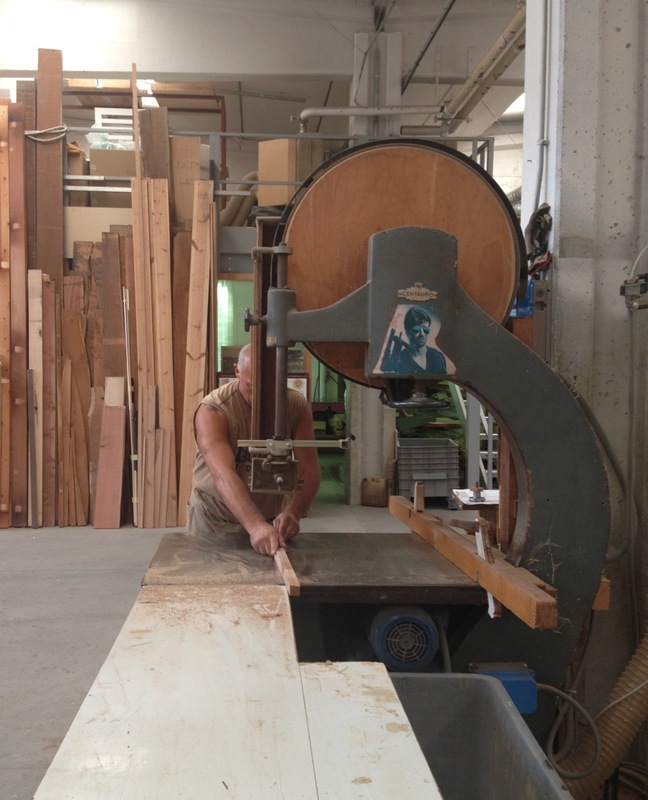 I personally choose and put together each peace of solid wood (see picture below) that Silvio cut by hand. It is very impressive. Exactly: in 29 days the bespoke interiors are ready to be shipped to New York! Of course Paolo and I supervise all the making process of what we have just designed. There is only a glass door between our office and the workshop. We often go in and out to check everything is done perfectly and take some picture of each manufacturing phase to share with both Diego and the Design-Apart team and Chris, the client. Indeed, the streaming helps us to inform very rapidly everyone involved in the project about the production and let them take part of it even though they are actually very far away. Chris is amazed: just back from his summer holidays, he finds the photo-streaming and sees his furniture during the making. He simply writes: wow! 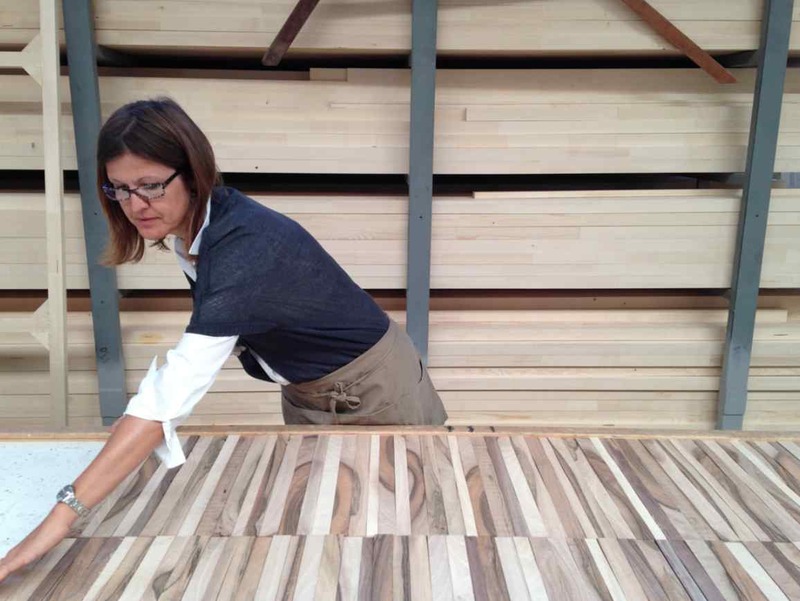 Design-Apart NY: ermesponti’s first wood-cut! 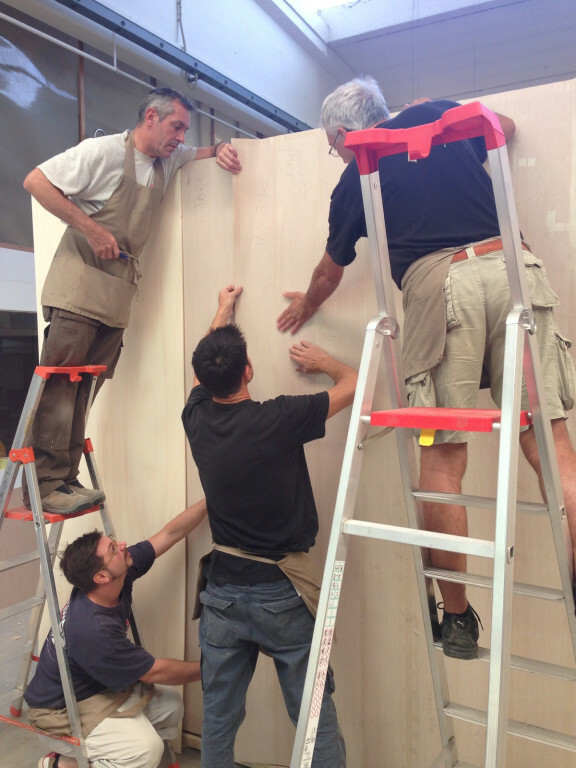 After two months dedicated to the design, the survey and the executive project finally we are cutting the first piece of solid wood! Yesterday, Silvio ( one of ermesponti master-carpenter) has begun to select and cut the old Italian walnut trees that will cover the main entrance wall of the first Flatiron loft signed by Design- Apart! We are proud to share with you this amazing project and each single phase of it! 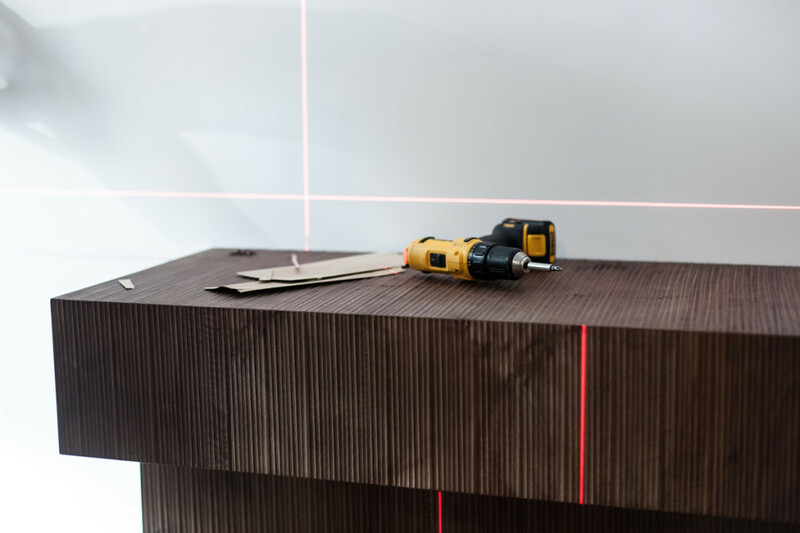 In the meantime Giuseppina – our seamstress- and Ermes Ponti – in person- are choosing, cutting and stitching together the oak veneers for the paneling between the living room and the kitchen. Yes, you understood well: we are not only interior and bespoke furniture designers; we also produce every single piece exclusively for you, around each need or dream you may have. We design as a stylist and produce as a tailor; but in between, even the fabric we select and weave it for you. You know, every tree is different like every man it is. 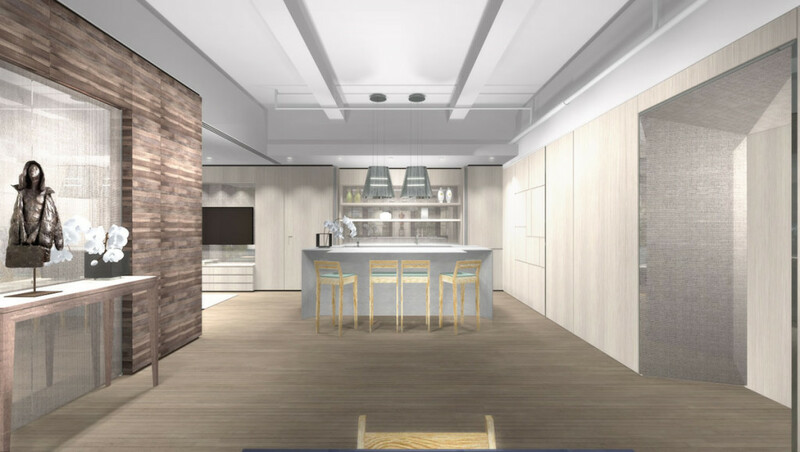 Are you ready to see the very first Italian bespoke loft in NY? Wait for a few weeks; we are coming soon before Central Park Autumn leaves are fallen! At the same time, in Ermesponti, our technician Mattia prepares all the production drawings and easily the making process starts according with them. Each master carpenter is in charge of a specific item: Silvio of the media cabinet, Giuseppe of the hall- kitchen boiserie, Roberto of the main tv corner cabinet, Marco of the Sintagma’s bookshelves and finally Alberto, the cherry on the cake, taking charge of the small console table that goes in front of the entrance. As a good tailor, we always start from a deepened dialogue with the client and a meticulous survey of the location. We start to plan only after receiving from Chis, the loft’s owner, the basic requirements for it. We make the 3D drawings to let him visualize our first proposal and we develop it until we get what he needs. We establish a good relationship with him during this short period, we exchange lots of mail with him and with his local architect, Bill. Now we have the first Design-Apart showroom! The location it’s amazing; a huge second floor loft on the west side of the 25th Street, just a few steps from Madison Square Garden. Diego gives to Paolo and me the task to do the project. Actually, we are the only ones in this newborn team to have the professional experience (more than ten years, all over the world) for planning a whole project and bespoke interior like this and in such a short time! We are proud to become the project HUB of Design-Apart! 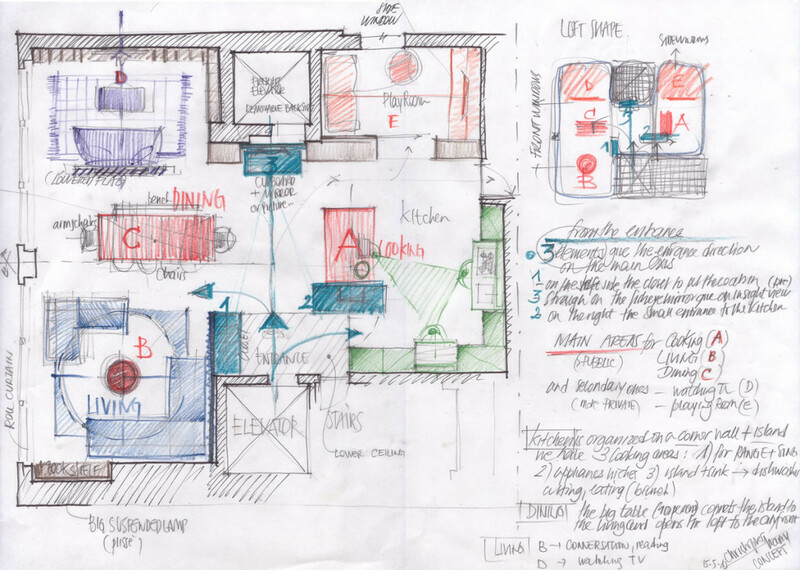 After Paolo’s survey, we are to complete the actual drawings for the works on site coordinated by Bill, the local architect and by Enrico, one of the founders of Design-Apart, especially in the last phase, before receiving the bathrooms and the furniture. After receiving the layouts of each location, I suggest Diego to send each client an easy questionnaire to fill in, so to get almost the basic requirements from each candidate (for us it’s impossible to start planning a bespoke interior without knowing nothing of the client!). As soon as we receive the answers, we begin to plan. We haven’t enough time to develop the 3 D drawing for each of them: its the middle of May, Diego and Enrico are in NY for the ICFF and have to meet the clients in the following week. But I can make easily by hand a lots of sketches, to show them how the single loft can be designed and furnished. Incredible: they like my sketches so much! One of them is so impressed that the week after, June the 6th, he decides to sign the contract! 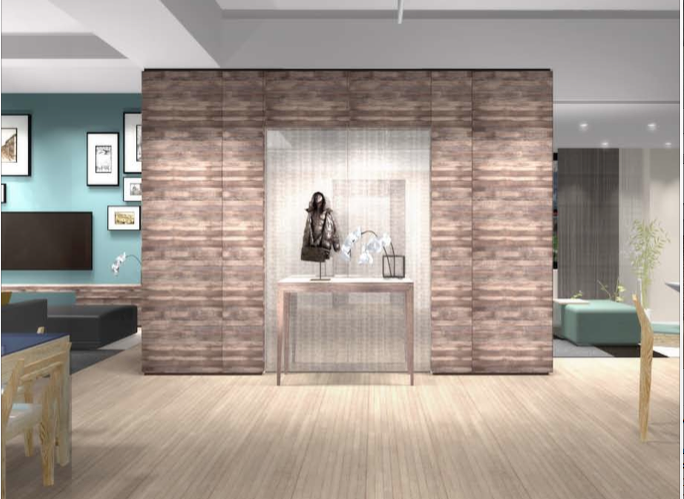 Design-Apart needs to find the right location for the first “living” showroom in New York. Diego and his family are supposed to move in and live there for a year. They will share their new home with American guests. Visitors will be regularly invited to enjoy the experience of top quality Italian craftsmanship and family life. 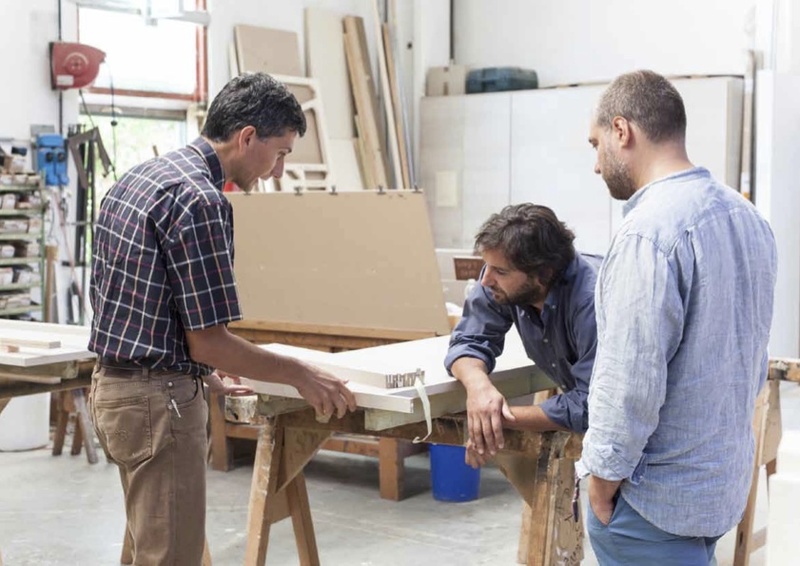 Diego has the great idea to engage the whole city offering to remodel and refurnish an empty loft with all the top quality furniture of the Design-Apart artisans and exchanging that with a 12-months free-rent hospitality. In a few weeks they receives so many great candidates! 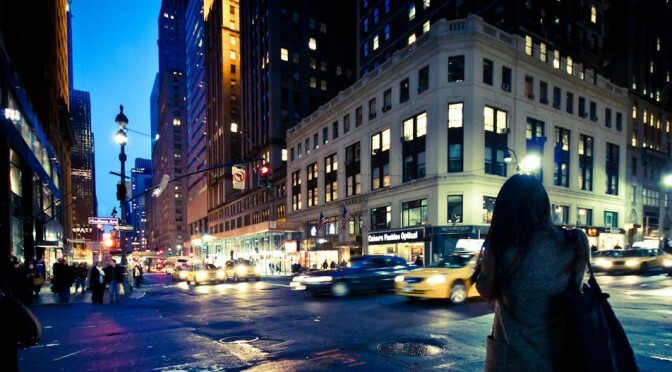 They select four of them: one on the 5th avenue, one in Flatiron District, one in Soho, one in Chelsea.